Pop Zhuzhette in your beach and handbag for tanning on the go! 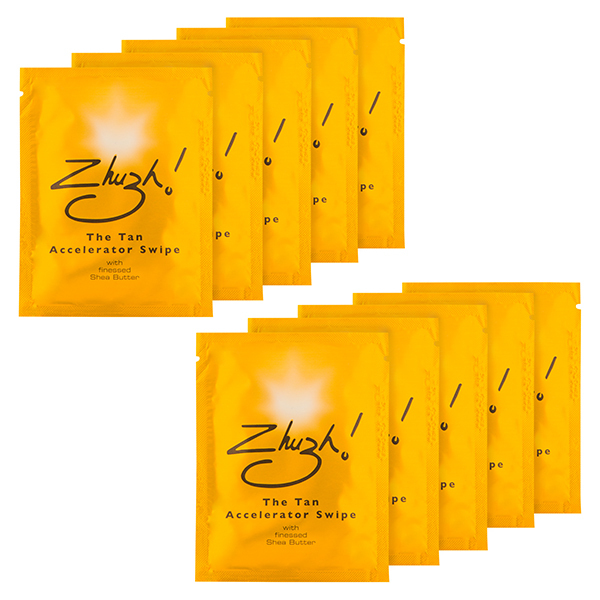 Zhuzh Tan Accelerator provides a quick and easy way to enhance the skin’s natural hues and tones for a gorgeous, sun-kissed complexion with none of the fuss. A lightweight spritz, there’s no unwanted stickiness or oiliness; simply rub into skin and go. This formula is designed to work with slow, naturally occurring melanin to help speed up tanning whilst moisturising the skin for a beautiful base. Not only do you look good, your skin feels good too! Give sleepy melanin a wake-up call with this fabulous set of travel swipes! Perfect for taking on walks, sitting outside or for day trips to the beach, one easy swipe will give nature a helping hand in achieving that all-over healthy glow.